The PowerShot S110 packs a world of advancements into its sleek, pocket-sized body. While the camera makes it easy enough for any user to achieve beautiful image quality, it gives serious photographers the tools they need to take their creative expression to the highest level. This is an incredibly convenient camera. Newly engineered specifically for the PowerShot S110, the camera's 24mm Wide-Angle 5x Optical Zoom lens with a focal length of 5.2–26.0mm (35mm film equivalent: 24–120mm) achieves f/2.0–f/5.9, giving the user exceptional versatility. The Wide-Angle lens gives your images a distinctive sweep and grandeur, capturing landscapes, cityscapes, tall buildings and wide groups of people with ease. The large f/2.0 aperture allows you to achieve shallow depth-of-field for creating portraits with beautiful, soft background blur, and incomparable Canon optical technology delivers a high performance lens enabling incredible images, even in low light. The PowerShot S110 is equipped with built-in Wi-Fi for on-the-go convenience. The camera makes it easy to connect directly to both iOS and Android devices, and upload images via the free Canon CameraWindow app. Using CANON iMAGE GATEWAY, you can easily post your images to your favorite social networking sites to update friends and family while you're traveling or just out and about. Even without a mobile device, you can send images to a PC, share images between Wi-Fi enabled PowerShot cameras and you can even print in a snap by sending your images wirelessly to a Wi-Fi compatible printer. 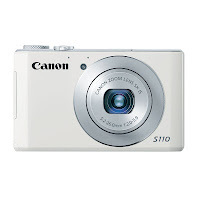 The PowerShot S110 employs a Canon 12.1 Megapixel CMOS sensor. Utilizing a sophisticated light-capturing design, it provides high sensitivity for improved high ISO capture with reduced noise. It is also a high-speed design, capable of rapidly capturing and moving image data to the processor, enabling faster continuous shooting and faster autofocus. The 12.1 Megapixel High-Sensitivity CMOS sensor works in concert with Canon's own latest-generation DIGIC 5 Image Processor to create the renowned Canon HS SYSTEM. With the Canon HS SYSTEM, you'll experience excellent tracking performance even in low light, and achieve gorgeous still image quality even at high ISO speeds all the way up to ISO 12800. The Canon HS SYSTEM lets you use higher shutter speeds to capture clearer images with reduced noise and blur, even when shooting video. The latest-generation Canon DIGIC 5 Image Processor works with the PowerShot S110's image sensor to bring phenomenal increases in processing speed and power. Improved noise reduction produces clearer images when shooting in low light at high ISO speeds. With the power of the DIGIC 5 Image Processor, the PowerShot S110 can achieve higher ISO sensitivity and even perform advanced functions like lens correction, special scene modes and much more. Simply touch the dedicated movie button, now conveniently embedded in the PowerShot S110's thumb pad, to start recording video in 1080p Full HD. Canon's Fine Detail Movie Processing achieves beautiful videos with high resolution processing that records approximately 4x the amount of information during video shooting. You're free to use the full range of the zoom in movie mode, and sound is recorded in stereo. An HDMI output allows you to view and share your video on an HDTV immediately, simply by connecting the camera to the TV with an optional HDMI cable. 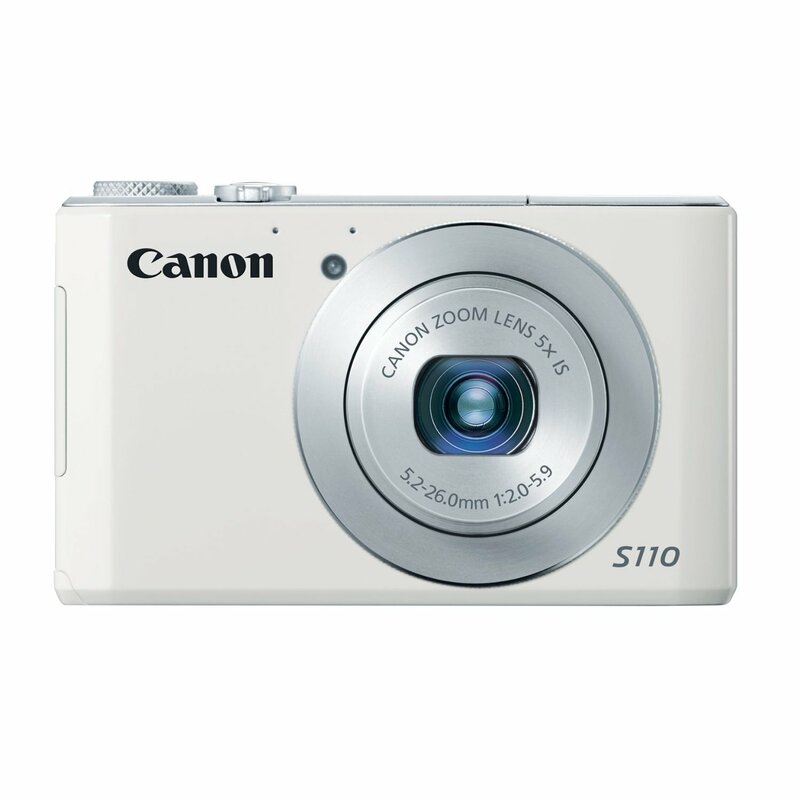 The PowerShot S110 is equipped with Canon's latest advancement in AF technology: High Speed AF. High Speed AF delivers significantly faster focus speed of 0.2 seconds and a dramatically reduced shooting lag time of 0.25 seconds. The technology also powers the camera's new High-Speed Burst HQ, with continuous capture at a maximum speed of approximately 10 fps. The big 3.0-inch PureColor System LCD responds to familiar one- and two-finger touch operations. Users can spread and pinch to change the magnification in playback, drag two fingers to switch display, use the easy interactive Touch Shutter, and quickly select camera settings. You can even adjust the panel’s touch sensitivity to your liking. The camera’s sophisticated control ring, located at the base of the lens barrel, can be used in conjunction with the Touch Panel to conveniently access a range of additional actions. It's easy to capture clear, steady images with the PowerShot S110, even in low light without using a tripod. That's because the camera is equipped with Canon's innovative Intelligent IS. The system analyzes camera movement and applies the best shake correction method for the shooting situation. For stills, the system automatically selects among Normal, Panning, Macro (Hybrid) and Tripod IS modes. When shooting video, the system automatically selects among Dynamic, Powered, Macro and Tripod IS modes. Focus, aperture, shutter speed, ISO, step zoom, exposure compensation, aspect ratio, i-Contrast, or white balance can be adjusted more quickly and conveniently with the PowerShot S110's control ring. Located at the base of the lens barrel, the ring is more intuitive than other types of controls. The functions that can be assigned to the control ring vary with shooting mode, and you can set your preferences quickly using the dedicated ring function selector button. As with many EOS DSLR cameras, the PowerShot S110 uses a 12-bit converter to process the output of the CMOS sensor. The PowerShot S110 lets you shoot in RAW mode, which records all the information captured by the sensor, giving you outstanding flexibility and complete creative control when editing your images with Canon’s powerful bundled software, and the camera allows you to record in RAW and JPEG formats simultaneously. Now in RAW mode, you can even select among several aspect ratios, including 16:9, 3:2, 4:3, 1:1, and 4:5. There are now a total of 30 display languages from which you can choose: English, German, French, Dutch, Danish, Finnish, Italian, Norwegian, Swedish, Spanish, Simplified/Traditional Chinese, Japanese, Russian, Portuguese, Korean, Greek, Polish, Czech, Hungarian, Turkish, Thai, Arabic, Romanian, Ukrainian, Farsi, Hindi, Malay, Indonesian and Vietnamese. It's quick and easy to make beautiful prints from your PowerShot camera with Canon's Direct Print system. Directly connect your PowerShot camera to a Canon PIXMA or SELPHY photo printer with a USB cable and simply press the button to print. The S110 looks identical to The S100, but let me tell you, Canon has made some huge improvements with The S110. Canon has improved upon the sensor and auto focus speed of this model, added usable ISO, WiFi and touchscreen functionality. Low light performance is a lot like that of The S95 and S100 combined. Allow me to explain. Sometimes The S100's colors would be a little off in low light, casting an orangish hue - as if shot in sepia. The Powershot S95 rendered sharp, detailed and very accurate colors in low light, but the lens was a bit slow under these conditions. I don't know what Canon did, but there is almost zero lag in AF, despite others claim that this is a slower lens or sensor than its predecessors. Color, contrast and sharpness are spot on! I predict that the next S model will have a larger sensor to be competitive with The Sony RX100's lowlight performance, but until then, I have to say that the S110 is very close in low light image quallity and will surpass the Sony, although at the cost of a higher price point and perhaps a larger form factor because of the larger sensor. The WiFi operates very efficently, and a cool, bright, blue LED lights up on the top of the camera when it is connected. It flashes when busy. The camera asks if you would like to geotag or log your location while connected to your phone or computer. It is a 2 second affair, so GPS no longer drains your battery. Built-in GPS and Eye-Fi cards do not work nearly as seemless as this! I had issues when first setting this connection up, because I thought I could bypass the step where you connect the camera to a computer via USB cable and run software CD. You have to do this step! I think you may have to also register your S110 for it to properly set up initial WiFi. The touchscreen is very responsive, and can be adjusted. Enough said on that. If touchscreen shutter is on, camera will take picture if finger contacts screen before you are ready. There is no loud knocking noise when zooming in video, but there is a slight whirling sound when I zoom in video. Hard to notice and can only be heard when passage is very quiet during playback, but it's there none the less. Wish Canon would get that worked out. I guess some things have to be sacrificed for a small form factor. Would you like to own this gadget? Reply in comments.